Wallace Seymour's range of auxiliary materials (mediums, varnishes and solvents) have been selected to combine tradition and innovation. At a time when natural materials have become scarce, expensive and hard to find, Wallace Seymour intends to continue to offer these niche products at sensible prices. Wallace Seymour products are all laboratory-tested and trialled in-house by artists. 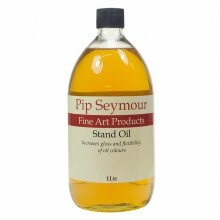 Because Pip Seymour are in the process of rebranding as 'Wallace Seymour', you may receive a product labelled as such. The contents will be identical.